International Journal of Research in Health Sciences,2014,2,1,207-212. 1-Department of Community Health and Family Medicine, School of Medicine and Health Sciences, University for Development Studies Tamale Ghana, GHANA. 2- Department of Allied Health Sciences, Faculty of Nursing, School of Medicine and Health Sciences, University for Development Studies Tamale, GHANA. Background: Surgical site infections are one of the most common causes of nosocomial globally resulting in high morbidity and mortality. Aim: To determine the prevalence and determinants of surgical site infections in the Tamale Teaching Hospital in Northern Ghana. Materials and Methods: A retrospective cross- sectional study where a month each was randomly selected to represent each quarter of the year 2012. Medical records in inpatient folders and nurses note books of patients admitted to the surgical ward diagnosed with surgical site infection by an attending physician were reviewed. Results: The overall prevalence of surgical site wound infection was 39%. 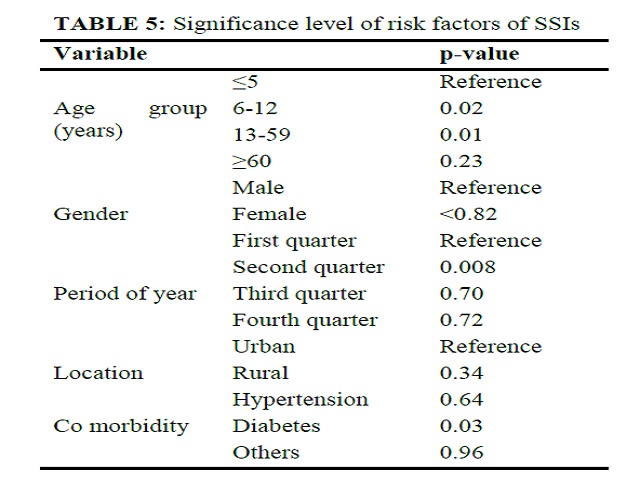 Determinants of surgical site infections were; long stays in the ward (p<0.001), diabetes (p=0.03), emergency/ elective surgeries (p<0.001each), second quarter of the year (p=0.008), young and middle aged groups (p=0.02 and 0.01 respectively) and certain surgical procedures such as abdominal, orthopedic and mastectomy all with p values of <0.001 each. Conclusion: The overall prevalence of surgical site wound infection is 39%. Significant determinants of surgical site infection were; long stays in the ward, diabetes, emergency/ elective surgeries, second quarter of the year, young and middle aged groups and certain surgical procedures such as abdominal, orthopedic and mastectomy.